I once worked with a woman who was always extremely well put together. One day she revealedit: she started her outfit by selecting the shoes and building up from there. It always seemed like such a simple concept - but at the same time somehow very extravagant - and needless to say, I never did follow her cue. But when Spygirl announced her 52-Pick-me-up theme, Feet first, I certainly wanted to try. Does the outfit make sense? Big flowers, little flowers, naive flowers, folksy flowers... How do you wear your florals, asks Spygirl. Here's the answer: I don't, usually. But this is flower is so abstract that it is just a graphic blob, making for a clean look. It is also naive, almost childish, which I like, it reminds me of my youth. From afar the delightful ditsy shirt pattern reads solid. I bought this mainly for fabric, the fit is rather boxy at the moment, hopefully I can work it into something more shapely. I also wore some stylized roses. Red and white reads summer to me. In excellent mood this morning. There is nothing like a refreshing rain after days of sultry heat. See how the rain glistens on the roof. Finally, finally felt like wearing a skirt (pant?) that I made in spring. 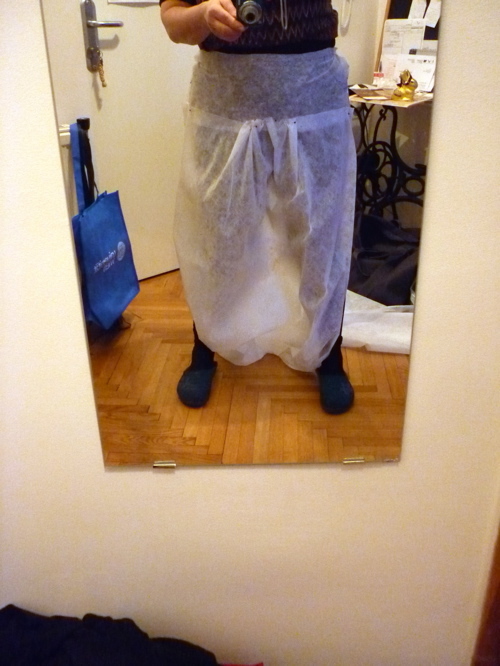 Essentially this is a wide skirt with small leg parts attached. I paired it with a Mid Mod jewelry piece (reissued Sarpaneva if I remember correctly) and a crinkly tee (which shows badly in today's light). I love the clothing made by the very talented folks at Variete van Kroen, who come to Vienna at least once a year. However, buying one was not an option last year. Instead, I decided to make my own. I searched high and low for a rayon denim which would give me the drape, but when this textured dark indigo woven cotton came my way I knew the pairing was perfect. I had to make the pattern. Here is me trying to imagine the finished effect. I made real pockets, and lined them with a fabric at hand - purple. It is very very comfortable, and looks hot with a biker type jacket which I wore later when the rain really picked up. Sorry, no pictures! Oh yes! Red and white, blue and black - let's see if I can cram them into a single outfit and not look too busy. Thank you Anne for the challenge! 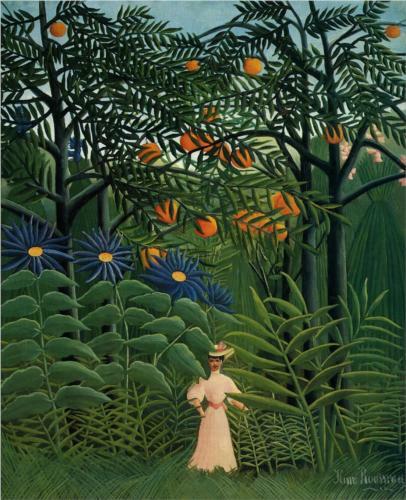 SIA, Style Imitating Art has a lush painting this week as inspiration, Woman Walking in Exotic Forest by Henry Rousseau. I wanted to bring in the lushness and exotic mood in with color. And as I don't wear such greens I took something else very exotic. This background fabric has followed me for 20 years. It is hand embroidered on coarse blue linen. I bought it because it was calling my name very, very loudly. I could not afford it, nor had I any idea what to use it for. A couple of years it lived in my cupboard. I would fondle it from time to time, feel the fabric, delight in the rich embroidery and vivid color. Then we found a wooden day bed on the sidewalk in Brooklyn, bought a foam mattress and used the fabric for cover. It wore all threadbare in the places where we would sit. It was our tv-couch, and we watched a lot of movies, a lot. Then we moved again, and now this fabric serves as curtain between the hallway and living room. Threadbare spots mean there is some daylight filtering into the dark hallway. I still love that fabric, and I know I will use it in the next place, too, as it has become part of me. I am wearing a printed linen skirt, a simple blue blouse with tie, a polished slab of apatite on a suede cord (by some Brooklyn-based artist) and pomegranate red shoes. I wanted to look exotic, and this skirt with it's exiting complementary contrast (see entry 25) is maybe the most adventurous thing I own, colorwise. Fun and creative, Spy Girl has us wrecking the brain again. Not that complementary colors are such a mystery - rather, it is: which complementary colors do you choose? I have some in my closet. The most exiting to me is a deep, almost mahogany brown paired with a midnight blue, something that I keep going back to time and time again. But now it's just past midsummer equinox - time of white nights and incessant sunshine in these northern latitudes. My choices for complementary colors were a dusty sage green paired with icy pink on the verge to lilac. I have dyed the scarf myself, in a remnant dye that has already seen some batches of yarn and was much diluted already. Icy pink makes my heart ache, I love that color! 24. In a Style Rut? Try Boyfriend-Girlfriend! Spy Girl had a great idea and created a challenge that's sure to breathe some life into your (stale) wardrobe. This week's a kick off of 52-Pick-me-up. Go on, plunge into your closets and come up with nice new combos and then link your pictures! The theme is a trusty boyfriend-girlfriend look with tomboy style as a variation. I like my clothing feminine, but have a soft spot for masculine suit pants. This being summer, I combined grey slacks with a shapely white tee. So much for foundation. For neckwear I had two choices, an Austrian Trachten style mock tie for women, or a real manly tie. I think I prefer the real thing! To balance out I am wearing red sandals. If they look like 50's, that's because they are. Kind of. Re-Mix shoe company in Los Angeles makes new shoes into old lasts. Either they are replicating themselves from 60 years ago, or someone bought up an old factory - you guys over there would know. Subtly colorful, loves cardigans, knits and opulent minimalism, in search of (lost) personal style and in a never-ending quest for the perfect wardrobe. I knit. I felt. I sew. I redo, mend and make do. Take a look at my *cool stuff for creative people*!